Can't attend? Follow Gramercy Music to know of future events! Which of these actually affect the sound of your string instrument? 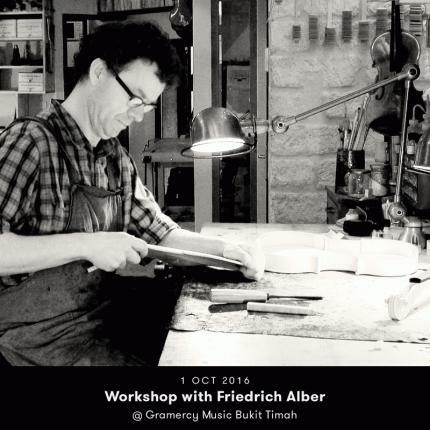 Find out at Friedrich Alber's workshop! Alber was a finalist in the Paris Violoncelleenseine competition. In 2010, his violin and cello were awarded 1st prize as the judges' favourite at the MUSICORA fair in Paris. Alber's instruments are inspired by the Italian model: Stradivari, Amati and Guarneri del gesu. He is inspired by German craftsmanship, French touch and the Italian tradition. 10 mins walk from Newton MRT Station, at the intersection of Bukit Timah Road & Makepeace Road.